The Senate Appropriations Committee is holding three weeks of public hearings on Governor Wolf’s proposed 2018-2019 state budget. Summaries and video of each of the first week’s hearings are listed below. I will follow up with the remaining hearings over the next two weeks. You can view hearings live here. It was a pleasure welcoming students from East Stroudsburg University to the Capitol this week as they participated in their annual student advocacy day. 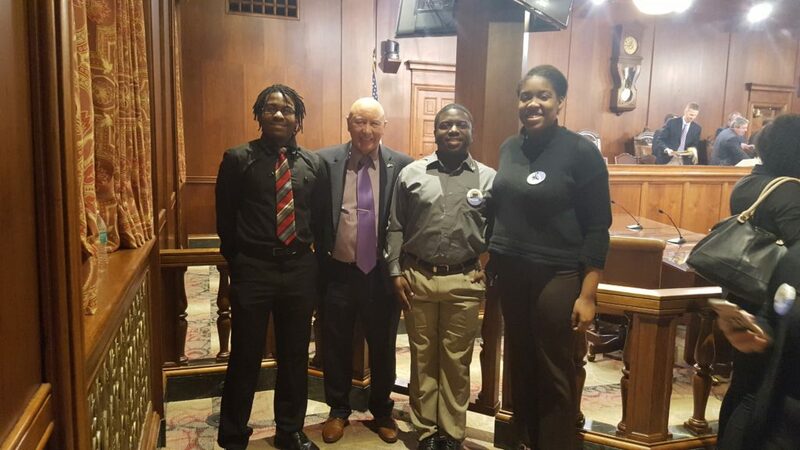 Pictured with me are Kevin Harris III, who is majoring in Philosophy and Psychology; Mark Davies, a Political Science and Spanish major; and Asia Morton, a History major. Thank you all for coming down to the Capitol and for your work supporting East Stroudsburg University and our State Schools. 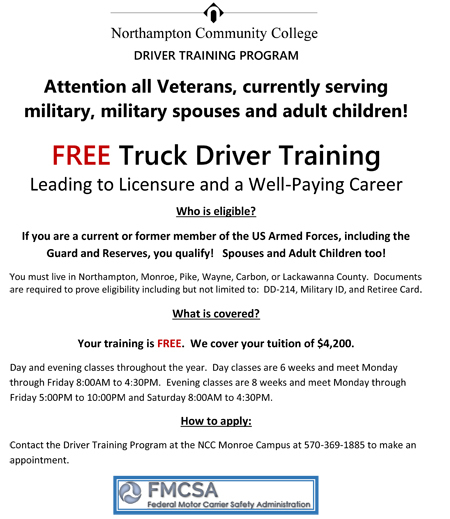 Northampton Community College’s Monroe Campus is offering a free truck driver training program all current or former members of the U.S. Armed Forces, military spouses and their children. This free training is a tuition value of $4,200. For specific information about the daytime and evening class offerings, please contact the Driver Training Program directly at 570-369-1885. Senator Scavello asked State Treasurer Joe Torsella about different rates of return on investment for the Pennsylvania 529 College Savings Program’s Guaranteed Savings Plan and Investment Plan, as well as efforts to inform students and parents about the plans. Senator Mario Scavello asks IFO Executive Director Matt Knittel about the impact gaming expansion will have on the PA Lottery and the senior citizens programs that the Lottery funds. Senator Scavello questioned school administrators about services to help children transition from school to independent living. Senator Scavello noted that Intermediate Units provide early intervention services that help save taxpayer money down the road. Senator Scavello asked about publishing new congressional district maps to inform voters of new boundaries, as well as online voter registration rates and the need for paper receipts for county voting machines. Senator Scavello lauded East Stroudsburg University’s Warrior Promise program and sought information on other efforts to draw students to State System universities. Senator Scavello sought information on the effect that Pennsylvania’s medical marijuana law might have on DUI enforcement and handgun ownership.